I've been testing recipes for Lamingtons all week. In fact, I'm pretty much on a cake baking rampage. Mr. P over at Delicious, Delicious, Delicious is hosting a Lamington contest. The prize? A Cookie Cutter that can only be described as freaking-awesome. Having serious cookie cutter collecting OCD, I knew I had to enter... often. Ms. Humble plays to win. So I settled into my Lamington-War-Room and worked out my ideas. I started baking cakes early this week and went through numerous recipes. Having been on the receiving end of a book store gift card for christmas I picked up Rose's Heavenly Cakes and now I finally have a chance to start testing recipes. Anyway, I decided to try one of Rose's coconut butter cakes for the base of this Lamington. 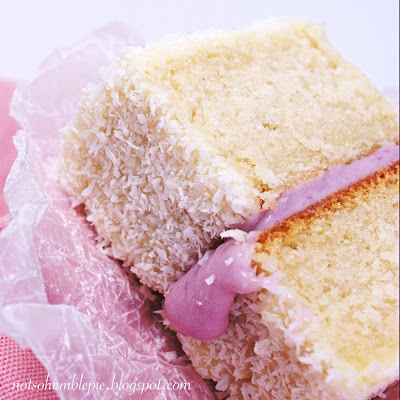 The result is an incredibly moist, tender cake flavored with coconut milk and extract. Rose's book gives the measurements in both weight and volume but I always get better results when baking cakes by weight. Also, I tend to lose count when measuring by volume. Did I just add three cups of flour... or four? You know you've been there, too. If you bake a lot, pick up a small digital kitchen scale, they are wonderful. Grease a 9x13 pan or two 9" rounds and line with parchment. Preheat the oven to 350°F with the rack in the lower third of the oven. Mix the eggs, 1/3 cup of the coconut milk and the extracts together in a bowl and set aside. Combine the remaining dry ingredients into the bowl of your stand mixer. Mix with the paddle attachment for 30 seconds on low speed and then add the butter and remaining coconut milk. Mix on low speed until the mixture comes together. Scrape down the sides of the bowl and then beat on medium speed for a minute and a half. Reduce speed to medium low and, working in thirds, add the egg mixture to the batter. Mix for 20 seconds on medium speed after each addition. Pour the batter into the pans and smooth with a spatula. Bake for 30-40 minutes until the cake springs back when lightly touched in the center and a cake tester comes out clean. Remove the cake from the oven and allow to cool in the pan on a wire rack for 10 minutes. Slip an offset spatula around the sides of the cake and remove the cake and allow it to cool completely on a wire rack. Place the chocolate in a heat proof bowl and bring the cream to a simmer over medium heat. Pour the cream over the chocolate and allow to sit for a minute and then mix until smooth. Coat the Lamingtons with the white chocolate, warming the ganache briefly in the microwave if it gets too firm. Then press each side into a plate of desiccated coconut. Set aside on a wire rack to dry and begin work on the raspberry filling. Heat the cream over medium heat to a bare simmer. Remove from heat and stir in the white chocolate until melted. Add the raspberry jam and mix well. Chill the mixture for 30-60 minutes. By the time the cream is cool, the Lamingtons will be ready to sandwich. 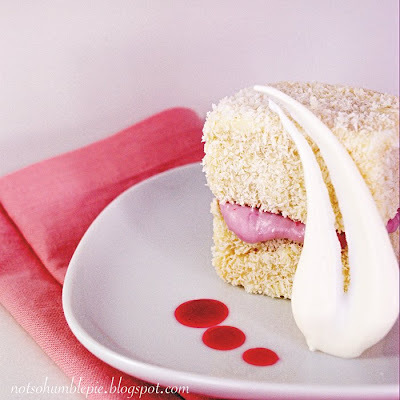 There you have it, a moist coconut Lamington with a white chocolate raspberry cream. A slightly different but yummy take on the traditional Lamington. Wait... maybe serving in crumpled wax paper isn't enough. What if I add a little raspberry and Chambord puree and a white chocolate... flourish thing? How is that?! With my next Lamington, I plan on breaking out the ol' kitchen butane torch... that should be fun. You're right -- that cookie cutter is worth all the work to get it just perfect! Best of luck to you! Looks quite scrumptious, even if I'm not much of a fan of coconut. Wow - dunno what a 'Lamington' actually is, but anything with coconut and I'm right there. This looks absolutely delish. Finger's crossed that one of your recipes win - I'd love to see what you make of the Welsh Dragon cookies, as your science cookies are a favorite of mine! I think you'll win...and that cookie cutter is awesome!!! Coconut anything makes me drool. Your photos are to die for!!! Wow, the 2nd photo goes to show how much of a difference plating makes... the first picture still looks yummy, but the 2nd one is cookie-cutter winning worthy... good luck! You're making my belly grumble...it's exceedingly unbecoming of me!! I am most definitely giving these little gems a whirl for Australia Day in a few weeks time! They look amazing! I'm not sure if it's the girly pink, or coconut.. but I am thinking spring when I see this! Must be mouthwatering!! This is A-MAY-ZING. I hope you win. This cake is GORGEOUS!! The filling looks like it's straight out of soem fairy-tale, something Barbie would eat, such amazingly beautiful color! Not only would I eat that cake off of wax paper, I would probably eat it off the floor. It looks and sounds amazing. As a cake connoisseur, I am always happy to hear about great cookbooks, so I will check out the two you've mentioned as well. Wooo, the TasteStopping editor! Hey there! Oh that cookie cutter prize is so wonderful, I might just start competing for it. And if neither of us win, I say we take up a collection of names for everyone who wants one and get some shipped over the pond. Ms. Humble... I am humbled. This is amazing. My lamingtons are not anywhere NEAR as pretty, and the wintry light I'm getting in the kitchen is making photography IMPOSSIBLE! At least I can put a photo of yours in my round up post and make my blog look pretty that way. Speaking of which - what are your thoughts on voting? I think it's fairer than using random.org, don't you? Everybody who enters my competition is making a big effort after all... Let me know what you think. I am going to research how I can do this. And thanks for entering! 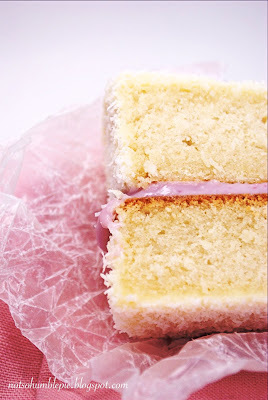 Spreading the lamington love one blog at a time!! Winter light has been awful for me too (not that it is ever really good in Seattle). But in all seriousness, yes I think Random.org is great. Win or lose, I am having lots of fun with the lamingtons. Holy moly that lamington looks flaming delicious! Good luck in the comp. That cookie cutter is amazing and worth the effort. Oh my! Could you have made this look any more fabulous?!?! That might be a nice cake, but it's not a lamington. The idea is to be inspired by the lamington, zezebelle. This uses all the classic elements of the lamington: jam, cake, coconut and chocolate and interprets them in a different and delicious way. It is a lamington, my lamington. OMG thats so beautiful! GREAT picture! Lovely, lovely Lamington! Yes, a Lamington, and a lovely one at that. So there! Yum! I've got to keep this in mind for October when I do lots of 'pink' cooking. Sounds great! Firstly, my white chocolate ganache was very, very thin. I used your measurements, but it was still more of a glaze than a ganache. It looks like yours was nice and thick, and made a good surface for the coconut to stick to. I tried adding more chocolate to thicken it up, but it still wasn't quite right. Also, I used sweetened coconut rather than dessicated. In my opinion, the sweetened is far too sticky and chunky for this application. I think dessicated is the way to go...it just seems like it would work, and look, better (mine looks like something the dryer coughed up after a round of white bath towels). The last mistake I made was using a pan that was way too small. I didn't realize until after I poured the batter in that it was smaller than a 9x13. As a result, my cake didn't cook properly in the center. On the bright side, however, it tastes fantastic (even with my substitution of coconut flavor for the extract...I just couldn't find it anywhere). I also used a homemade black raspberry jam. It's a very pretty purple color, and the taste is scrumptious. Thanks for all your hard work! You inspire me to keep trying!! All your lamingtons are amazing - did you win?